Emily and Matt will be married later this fall with the wedding ceremony to be held at the United Presbyterian Church with a wedding reception to follow at the Fez in Hopewell twp. 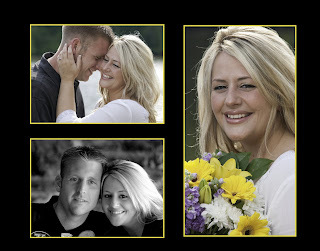 PA. We had a great time shooting their ‘engagement’ portraits at the North Park in the North Hills of Pittsburgh. A few of the photos were taken on Marshall Island, which created a great backdrop for the portraits. The sun was setting over the water and it created a great back lighting situation. Emily looked beautiful with the light causing her beautiful hair to glow in the setting sun. After a few shots on Marshall Island, we headed off to a second destination in North Park, the ‘School House’. It is an old shelter with tremendous character. I found it earlier in the day when I was driving through the park looking for buildings with character. Inside the shelter are two stone fireplaces with an amazing look. Under the shelter were many arched entranceways that enabled creating great images a ‘breeze’. 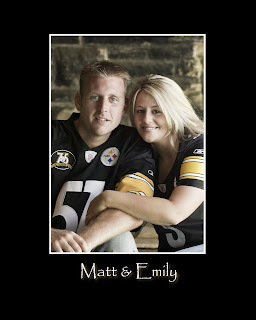 Emily and Matt are faithful Pittsburghers and brought along their Pittsburgh Steelers jerseys to wear in few portraits. I had a tremendous time spending a couple hours with Emily and Matt, discussing the wedding and taking a few fun portraits. The images were shot with the Nikon D300 and a variety of lenses including the Nikon 70-300 vr, Tamron 70-200 and 17-55 f/2.8. The lighting was an off camera SB800 shot through a white umbrella. As always, get out and capture the beauty of life, 'one click at a time'.